Here's a cheerful Socklet to wish you a Happy Easter and much chocolatey goodness to celebrate the special day. ...which is a bit of an unpleasant thought considering they are made out of fat. In keeping with the Who weekend, welcoming the start of the next part of the series...here's an Adipose I made for my daughter ages ago. She had a little collection of them and was dressed as Miss Foster, the nanny, at the time. If you are a collector of Dr Who comics gone by, you might even see her photo in there. Tardis...or just a mad woman with a box? It started with just a box...but the fun of transforming shallow boxes into a treasure trove of little display units is just irresistible. 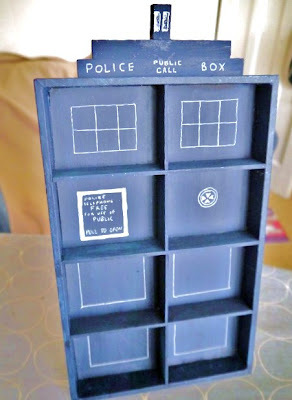 This is one I made for my friend B who is as mad a Whovian as I am. The shelving is just balsa wood cut to size and glued in place, then painted. The layers and light on top are similar and the white decrorations inside are made with a white gel pen, a ruler and a steady hand! It's about 30cms high and was empty when I gave it to her 'cos I know she's got lots of tiny Whovian things around the house to fill it...and if it's not quite full, thats just an opportunity to get/make some! Obviously I had to play with it first to make sure it was fit for purpose, so I filled it with some of the toys I had collected from the front of the comic a while ago. I have another, more sinister, Who project in mind for them! ...And to know that they are SO happy to volunteer for the job! If you look on google images, there are loads of people out there making food from felt. I must say its quite addictive. Not everyone puts button eyes and a smile on it but I can't resist. When I food grouped them it was for their similarity of colour for photography, not their nutritional groups...ham and eggs are not a sugary pudding and cheese is not a fruit or veg! These two dreamed of a stage career but when injury sruck one, they decided to stay together and set up a dance school instead. "Fame costs...and right here's where you start paying.." and then go into fits of giggles. Actually some people can look scary on the outside but are not as they appear. The same may be true here. As he was being sewn he was determined to look like this so what could I do? It may all be an act to find his place in the world and make other people keep their distance. Found a fairy I left out of the last photographic episode so I thought I'd better include her. It's never wise to upset a fairy by leaving it out of some occasion or other...a well documented fact in stories. They tend to turn up unexpectedly and create chaos that can last at least until someone's 16th birthday. Better to err on the side of caution! Wintery and beautiful or slightly wild, white and scary? Here's a band of Sock-Pirates ready for action. I would say...You will never find a more wretched hive of scum and villainy... but they're quite cute and good natured really. If you look carefully at the complete array of owls in the photo below (as in yesterday's blog) you will see in the centre an Evil Penguin. He was an experiment using a variation on the owl pattern and, as I didn't like the look of his beakless face and had no fabric to alter that, I put a scarf over his face and he turned to a life of crime as if he'd been born to it. He has cold blue eyes and a definite air of menace, always an advantage for threatening jobs. The only weapon he had to hand was a safety pin (fastened) but I intend to upgrade this to a fake gun at some point. He and his dastardly band of outcast owls roam the living room threatening any owls which become separated from the main parliament and demanding buttons. A friend of mine got permission from the creator of these owls to use the pattern and she made a few changes and gave it to me...I made a few more changes and made these to raise money for the National Autistic Society and Disability Challengers. I was given fabric samples from a pattern book so could make a variety of owls very cheaply. I made them huge and I made them small. One lady bought all 14 of the little ones and was going to sew a loop of thread on their heads and give them to her friends as christmas presents to hang on their trees. It was my Dad's 82nd birthday yesterday. He's a techno-man with a Nexus, so among the books and boxes of chocolates etc that always appear at his birthdays, I thought I'd add a Nexus obsessed Socklet. The tiny Nexus and the stylus are made from black shrink plastic and hole punched before they are shrunk so I can sew through the tiny hole, letting the Socklet hold them. Actually, having said that, she looks petrified. First visit to the sea and its so huge and noisy and relentless...she's a bit overwhelmed. Don't worry, she'll love it soon. Strange Old Lady- Beware the Cake! This Socklet is somewhere between a Tim Burton creation and Mrs Figg from Harry Potter and I wouldn't be surprised if Hansel and Gretel met her along the way. She puts the weirdest things in her cakes and the ingredients, if not the cakes themselves, are likely to be a few years old. So if you meet her, be kind... but find some way of avoiding eating whatever she's offering you! I'm with Matt Smith on this one...bow ties are definitely cool and the bigger the better...as is demonstrated by this cute socklet. He's just the sort of chap you could take home and introduce to your mother and she wouldn't object: polite, chivalrous and well dressed (in the bow-tie department anyway!!). How much of a fashion faux-pas are the turn ups? Or are they the in thing? So hard to keep up when the only clothing you seem to buy these days is socks! It's a definite step up from Frog Prince....promotion. Another one made from the Sew me Love me book (see yesterday's blog) and looking very different (and smaller) cos of the fabric used. This fabric still has quite a stretch, essential for this pattern, but not as much as the jumper of Dr Death yesterday. An unlikely friendship you might think...but a good one. There's fantastically cute book called 'Sew Me, Love Me'...and I have and I do. In it there's a pattern for a kind of alien looking frog creature and, depending on what you make it out of, it can vary in outcome enormously. This one is made from a pale blue lambswool jumper from the charity shop. He's called Dr Death, not because of his propensity to finish people (or frogs) off, but because he travels the world looking for ancient bones and tries to work out what happened to their owner. He's very intense and a little obsessed, but extremely clever and dedicated to his work. He has met many eminent people and become very good friends with the Frog King (more of him soon). Back to the Socklets...this is the nameless Shepherd and his two sheep: Elvis and Tina. I wonder which you think is which? There is a third but she has got herself lost around the house at the moment and missed the photo opportunity to join them. They are characters for an idea that has been bouncing around in my head for a while trying to get written, hence the storybook background. ...and are the right size to fit in a small fist. They look both cute and a little fiendish when they have their leathery wings wrapped around their little bodies. She bought the Moomin notebook and supply of new socks to feed my habit, but then spent many hours making Snufkin, complete with hat brim that can be bent down to cover his face when he has a snooze in the long grass! How fabulous is that?? The accompanying letter, with red wax seal, is message of thanks written in high-faluting language, for raising herself and her younger brother to be such bold adventurers in the world. Here are the wonderful Gru and his minions made from wool in an Amigurumish way. There are some beautifully made ones out there from people who are much more precise at the art than I am. It was the three minions dressed as a pretend family that fascinated my son so I had to try my hand at those. Ours live in a cardboard box dolls house with furniture made from odds and ends...Oh and I had to make the three little kittens from the dreadful story Gru had to read to the children at bedtime. Different style to my usual sock creations and, although I enjoyed making them, they felt a little too like normal shaped toys from shops and less like something of mine. Couldn't decide if they were goth, emo or zombie-like...hence the title question. What would you reckon? Back to the socks...naturally. This is one of my new batch of socklets with accessories. He is a cool dude and has a pull-back skateboard that can get up to quite a reasonable speed. He bears a passing resemblance to the Maki sushi chef from the Valentine's day post... but he'd hate it if you pointed that out. My son is a big Super Mario fan so these were made for him, cos it's easier and cheaper than finding and buying the toys. Bee Mario was a particular favourite. Being Autistic, he is often into TV programmes, films and computer games which were either made many years ago or which never had a toy franchise in the first place. Either that or the things that take his interest would never be noticed or wanted by anyone else, so making them is sometimes the only option. As a child I was always freaked out by knitted toys...still am if truth be told. Its something about their huge lifeless, vacant forms and the knowledge that they are probably stuffed with years-worth of old ladies' tights that does it! However amigurumi are something different. They are very cute and so small there's no room to stuff even the leg of a pair of tights in them. Phew! They are little crocheted creatures that, with skill, can be formed into many different shapes, small enough to be grasped round the middle by a small fist and squeezed. Here are a couple of mine...more another day. Most of us love a tiny bit of weird in our lives...and these are really tiny. Made from clay for fund raising craft fairs, they stand about 1.5cms high on average...all colours and expressions catered for. People spent ages finding the Little Weirdo that matched their personality!! Do you know, the longer you look at the word weird or check that you've spelt it right, the weirder the word looks?